Markets were mixed ahead of the commencement of first quarter earnings season and data that confirms the economy is on solid footing. Commenting about the data, weekly jobless claims are at the lowest level since October 1969, confirming last week’s plunge. The more reliable four week moving average is at the lowest level since December 1969. At some juncture, a more noticeable increase in wages should occur. I must write however year over year wages are up about 3.2% as compared to 2.8% the year before. There was little reaction to rising producer prices, prices that rose more than expected at both the core and overall level. Commenting about earnings, all will scrutinize forward looking statements. As widely telegraphed, results are expected to decline around 5%. As of Monday, more than 20% of the companies in the S & P 500 had preannounced expected results and nearly 80% of them told analysts to lower their expectations. Information technology companies are expected to report an 8.7% drop in first quarter profits according to Bloomberg. Overall tech earnings are expected to decline by 11%. Investors have not been deterred as they are willing to pay a premium that’s close to highest since 2000. I think Amazon’s letter to shareholders offered considerable perspective about current valuations. Amazon sold about $232 billion of goods/services last year, up about 19% from the prior year. Wal-Mart sold about $500 billion of goods. Amazon’s sales growth was notably lower as compared to a 24% and 27% increase for 2017 and 2016 respectively. According to the US census Bureau, total online sales rose about 14% as the traditional retailers have created on-line platforms thus suggesting Amazon’s growth rate is not that superior as compared to those of the traditional retailer. I also think it is noteworthy that 90% of US retail sales still take place in physical stores. The issue at hand is valuations. Amazon is up about 23% YTD and is worth about $910 billion, trading at a large multiple indicating great expectations of exponential sales and revenue growth. Wal-Mart is up about 7% YTD, has a market capitalization of $285 billion whose on-line sales is increasing around 18%, a similar rate as Amazons’. How will this disparity unfold? Is this simplistic comparison between two retailing leviathans a possible reason for Jeffries and Stanford Bernstein’s bearish comments? Perhaps. Last night the foreign markets were up. London was up 0.42%, Paris up 0.39% and Frankfurt up 0.64% . China was down 0.04%, Japan up 0.73% and Hang Sang up 0.24%. The Dow should open moderately higher on JP Morgan’s earnings as well as stronger than expected credit growth in China. Oil and copper are both higher by 2% because of perceived strength in the global economies. The 10-year is off 12/32 to yield 2.55%. 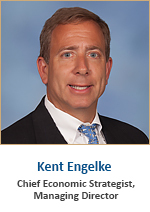 The views expressed herein are those of Kent Engelke and do not necessarily reflect those of Capitol Securities Management. The information contained herein has been compiled from sources believed to be reliable; however, there is no guarantee of its accuracy or completeness. Any opinions expressed are statements of judgment on this date and are subject to certain risks and uncertainties which could cause actual results to differ materially from those currently anticipated or projected. Any future dividends, interest, yields and event dates listed may be subject to change. An investor cannot invest in an index, and its returns are not indicative of the performance of any specific investment. Past performance is not indicative of future results. The material provided in Daily Market Commentaries or on this website should be used for informational purposes only and in no way should be relied upon for financial advice. Please be sure to consult your own financial advisor when making decisions regarding your financial management. Members of FINRA and SIPC, Capitol Securities Management is a privately owned full-service retail brokerage and investment advisory firm headquartered in Richmond, Virginia. For nearly 30 years, we have been serving the needs of our investors. Today, more than 200 Capitol Securities Management investment professionals and support staff serve approximately 18,000 customer accounts from Southern Florida to the New England coast.